Can a squash taste like spaghetti? In the winter, my favorite Trader Joe's store carries spaghetti squash. The bright yellow color grabs your attention as you walk to the produce section of the store. I passed them a few times in the past, until last year when my curiosity got me to purchase one medium sized spaghetti squash. I wondered on the possibility of turning this neon yellow and oblong squash into spaghetti. Do I need a cantaloupe scraper, a grater or a special gadget? Will it really taste like spaghetti? The squash is as hard as a rock. At first, I thought it was a vegetable, but since it has seeds, it falls under the fruit category. So another failed attempt on serving vegetables in the guise of a pasta. I searched online for recipes and they all required that I cut the squash in half before baking in the oven for an hour. BUT, the squash is as hard as the rock. I couldn't get the knife through without the thought of me stabbing my hands and fingers. My mom got me a microwave baked potato bag, unfortunately, the squash was too big for the bag. So I decided to bake the whole spaghetti squash, uncut. 2) Thoroughly wash the skin of the spaghetti squash. 3) Put the squash in a Pyrex baking dish. After an hour, the squash is soft and easy to cut. 6) Use a spoon and fork to scoop out the seeds. 7) Use the fork to scrape out the spaghetti squash. 8) Season with salt, pepper and garlic powder. Bake at 350°F for 30 minutes. Sprinkle with grated parmesan cheese. Serve with Baked Honey-Dijon-Paprika Chicken and steamed broccoli. Does the spaghetti squash taste like spaghetti? No, it doesn't. It's more like the Filipino rice noodles (pansit bihon) or angel hair pasta. For a comprehensive list of recipes and different ways to cook spaghetti squash, visit the Chew World. 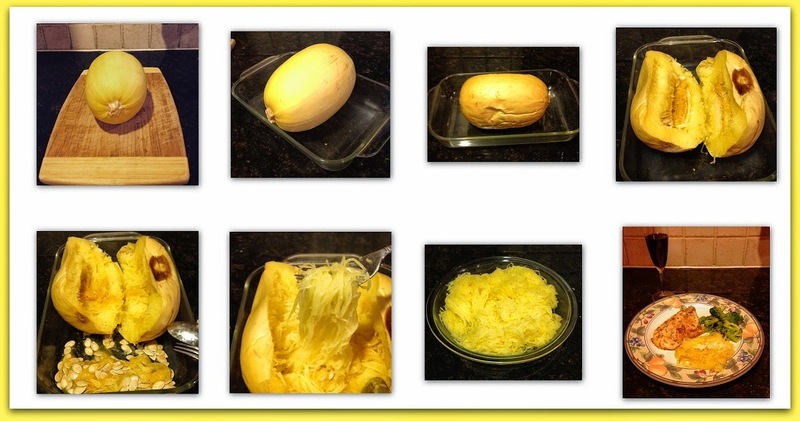 To read more on the "Ultimate Guide on Cooking Spaghetti Squash", visit the Quick Easy Cook.